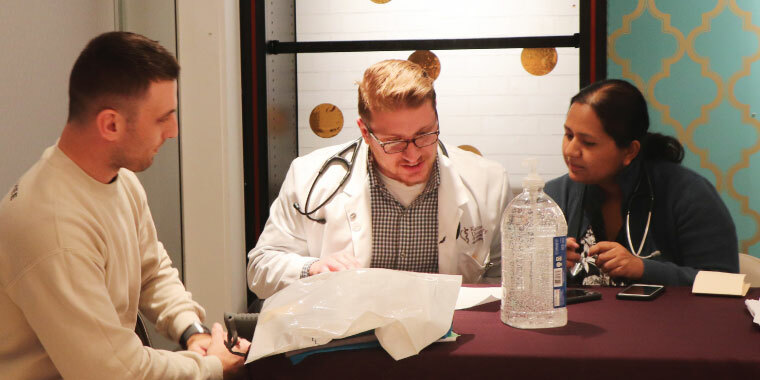 The Kansas City University of Medicine and Biosciences Joplin Campus recently partnered with Missouri Southern State University (MSSU), Freeman Health System and Northpark Mall to host a free health screening event for Joplin community members. Under the supervision of KCU-Joplin faculty, KCU-Joplin medical students worked side by side with students from MSSU’s Health Sciences Department, as well as Freeman residents and Freeman Screen Team staff, to provide health assessments to community members, including blood pressure, body mass index, diabetes screening, heart health, lung function and oral cancer. “Health screening events demonstrate KCU’s commitment to serving our community while allowing our students to develop the physical exam skills they need to become excellent physicians,” said John Paulson, DO, PhD, KCU-Joplin primary care department chair. 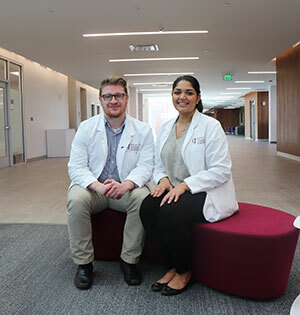 Patel and fellow second-year medical student Brandon Tompkins worked at the health education station, where they assisted KCU faculty and Freeman residents in counseling participants on topics such as a healthy diet, exercise and smoking cessation. “We helped educate them on the next steps to improving their quality of life and health,” said Patel. Following a visit to each screening station and the education station, participants who were determined to need further testing were directed to the Freeman Screen Team’s lab station to receive the hemoglobin A1C test, which measures blood sugar, and the low-density lipoprotein (LDL) test, which measures ‘bad’ cholesterol. Patel and Tompkins also had the opportunity to work at this station, where they learned how to draw blood samples for these tests. “The staff taught me how to draw blood, which was great experience. When I went in for my shift at the Community Clinic the next week, I already knew what to do,” said Tompkins. In addition to providing a learning experience for students, the event was an opportunity for community outreach. “Events like these are a great opportunity to support community health," said Ronnie Martin, DO, KCU-Joplin interim campus dean. "Health screenings are not intended to replace a doctor-patient relationship, but they permit those who having challenges with access to obtain a snapshot of their health, and provide assistance to the patients in establishing a relationship with a local physician if needed." KCU-Joplin will host a second community health screening event on Thursday, Feb. 14, in Pittsburg, Kan.